Buy Sheila the Wonderbink a Coffee. ko-fi.com/wonderbink - Ko-fi ❤️ Where creators get paid by fans, with a 'Buy Me a Coffee' button. 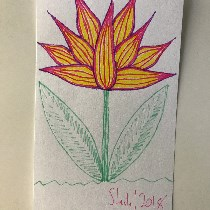 I draw flowers. I also write stuff. Much, much more about me (and this project) can be found at the link below this. Welcome to The Ten Thousand Flowers Project! My goal is to draw ten thousand flowers on index cards and give them away to people. If you would like to throw a few bucks in my direction, I can use them to buy pens, index cards, and labels to complete the project with. Secured Payments. Support goes to Sheila the Wonderbink's account. Upgrade Sheila the Wonderbink to a yearly Gold Membership with a one-time payment.